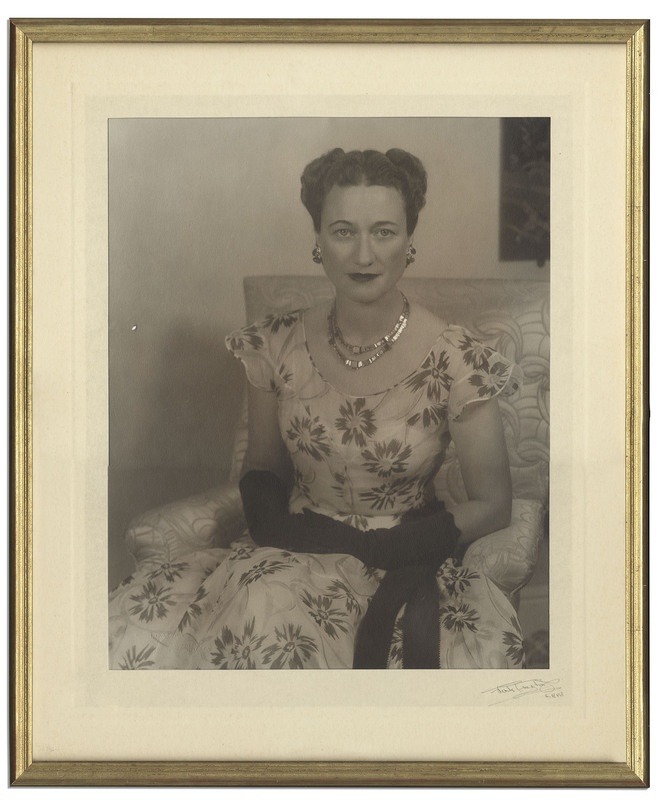 Wallis Simpson portrait photo. Large sepia photo nicely portrays the American socialite for whose hand in marriage King Edward VIII abdicated the throne. Photographer Frank Turgeon adds his signature in pencil to the mat at lower right and his blind stamp appears on the lower left of the image. A contented-looking Simpson is seated, wearing a floral dress, jewelry and dark gloves and lipstick. 11.5'' x 15'' matte finish photo is matted and framed to an overall size of 15.25'' x 18.75''. Fine. With stickers affixed to frame glass at lower left and to verso from the 11-19 September 1997 Sotheby's New York auction. Auction closed on Thursday, August 29, 2013.